The mapping entries also record the date that state data was captured and restored, the location where state data is stored, and the encryption key for the state data. For side-by-side migrations, you manually create computer associations. 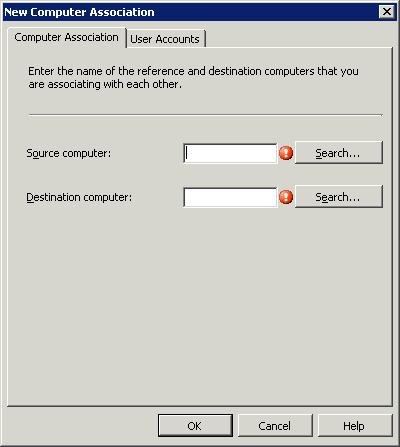 Right-click Computer Association (Site Management -> Computer Management -> Operating System Deployment -> Computer Associations) and choose New -> Computer Association to launch the New Computer Association dialog box, shown in Figure 1. This dialog allows you to specify the source and destination computer. You can use the User Accounts tab to specifically limit which profiles are captured. You must create a side-by-side computer association manually before an applicable task sequence is run on a system. If one does not exist, ConfigMgr automatically creates an in-place computer association. The next sections discuss recovering previously captured user data and importing computers previously unknown to Configuration Manager. Miguser.xml, migapp.xml, and migsys.xml are the xml configuration files used to capture the state. 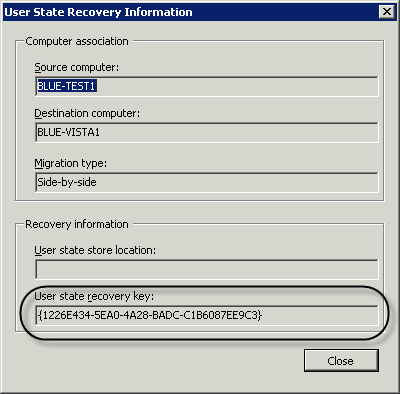 Recovering previously captured user data restores the data contained in the state store to the system where the command is run, which might cause local data to be overwritten. If you want to use a new system as a reference computer or deploy an image to a new system using PXE that does not have a client agent on it, you must make the system known to ConfigMgr; this capability is known as unknown computer support. You can do this using a computer association or the MDT, or with the unknown system resources functionality available in R2. If the PXE deployment point is on a site server, the smspxe.log is located in %ProgramFiles%\SMS_CCM\Logs; otherwise, you can find it in %windir%\system32\ccm\logs. You can also specify a source computer to import user and system state settings from; this creates a computer association with the specified computer as the source and the new system as the target. Importing computers one at a time can be time-consuming; alternatively, you can import multiple computers at once using a file formatted with comma-separated values (CSV). You can create this file with Microsoft Excel, Notepad, or any other text editor and save the file using plain text format. The file must contain the desired names of the systems and either their MAC addresses or SMBIOS GUIDs, comma-separated. Optionally, you can specify the source computer for user and system state migration. 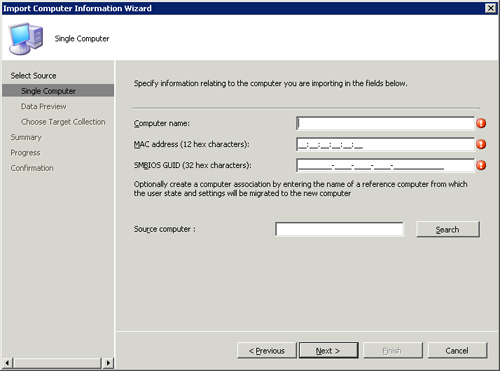 To import multiple computers, choose the Import computers using a file option from the Import Computer Information Wizard. The wizard prompts you for the CSV file to use and allows you to map the data in the file to the correct columns. The last page of the wizard is the same whether you import a single or multiple computers: You can choose to add the new systems to the All Systems collection or to one that you specify. You should choose to import the new systems into one of your OSD collections so that the appropriate task sequence-based advertisements also apply to your new systems. The way most PXE boot screens display the GUID does not correspond to the way ConfigMgr expects it; the GUID is the same but displayed differently. The result is ConfigMgr will not find the system, causing the task sequence to be unavailable or the PXE boot to fail. If you choose to use SMBIOS GUIDs, the best place to get them is from the smspxe.log on the PXE service point. The MDT offers an alternative way to handle unknown systems when PXE booting; it installs a VBScript-based PXE filter that automatically creates a resource in ConfigMgr for systems that do not already have one. This resource is identical to that created with the method just described in the “Using Computer Associations” section. In addition to these two new resources, ConfigMgr creates a new collection, called All Unknown Computers. These two resources are initially members of this collection, so you can use it to target OSD deployments. Unknown computer support in R2 is enabled by checking a check box on the ConfigMgr PXE service point properties dialog box . You can also enable unknown computer support for removable boot media by checking the Enable unknown computer support check box on the security page of the Task Sequence Media Wizard. Installing ConfigMgr 2007 R2 also adds a new node to the Operating System Deployment subtree in the ConfigMgr console, called Unprovisioned Computers. When ConfigMgr begins an OSD deployment to an unknown computer, it creates a new system resource for the new unknown computer and assigns it a unique identifier. When the deployment finishes successfully, the resource is removed from the Unprovisioned Computers node. If the deployment fails, the resource remains in this node. In general, the resources in this node are informational only and used to track deployments to previously unknown computers using the new unknown computer resources.